made by Edilportale, concept by the University of Trento. 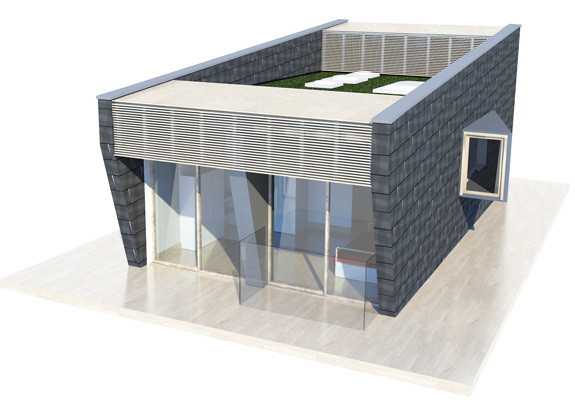 Livingbox is a prefabricated modular, transportable, recyclable and energy efficient unit, for residential or hospitality use on a temporary or permanent basis. Designed to fit into a container, it can be erected as a single unit or as an aggregation of several blocks, creating a true 'Livingbox Village'. Functionality and design in keeping with energy saving and rational use of space. The biocompatible structure, made up of XLAM panels, and the use of natural insulating materials keep CO2 emissions down. Featuring several design solutions that optimize energy independence, Livingbox can boast the ICMQ MAKE IT SUSTAINABLE certification. Minimum thickness of insulating materials, furnishings and peripheral control services are designed for a rational use of space, resources and materials, for an immediately habitable and comfortable unit.